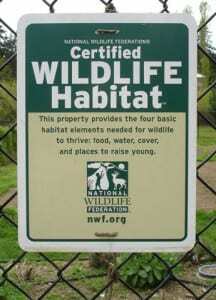 What’s a certified wildlife habitat? Brandy Stier from the West Sound Wildlife Shelter tells BCB host Sandy Schubach about the next lecture in the Brown Bag Lunch Lecture Series, to be held at the Waterfront Community Center at 11:45 on Friday, February 6. Presented by the West Sound Wildlife Shelter and the Bainbridge Island Land Trust, this popular series includes lectures by local experts on unique Bainbridge Island wildlife and landscape topics. This upcoming lecture will explain how to create your very own certified backyard habitat. Bainbridge Island Land Trust is co-hosting five Friday lunchtime talks on local wildlife and their habitat. It turns out anyone with a good-sized backyard can create a garden that attracts beautiful wildlife and helps to restore habitat in commercial and residential areas. By providing food, water, cover and a place for wildlife to raise their young, you not only help wildlife, but you can also be certified, to join the nearly 140,000 official National Wildlife Federation Certified Community Wildlife Habitat™ sites across the country. Credits: BCB host, studio tech, and audio editor: Sandy Schubach; BCB social media publishers: Diane and Chris Walker.